This assay employs a two-site sandwich ELISA to quantitate HHV6-Ab-IgM in samples. An antibody specific for HHV6-Ab-IgM has been pre-coated onto a microplate. Standards and samples are pipetted into the wells and anyHHV6-Ab-IgM present is bound by the immobilized antibody. After removing any unbound substances, a biotin-conjugated antibody specific for HHV6-Ab-IgM is added to the wells. After washing, Streptavidin conjugated Horseradish Peroxidase (HRP) is added to the wells. Following a wash to remove any unbound avidin-enzyme reagent, a substrate solution is added to the wells and color develops in proportion to the amount of HHV6-Ab-IgM bound in the initial step. The color development is stopped and the intensity of the color is measured. This assay has high sensitivity and excellent specificity for detection of Human HHV6-Ab-IgM. No significant cross-reactivity or interference between Human HHV6-Ab-IgM and analogues was observed. Matrices listed below were spiked with certain level of recombinant Human HHV6-Ab-IgM and the recovery rates were calculated by comparing the measured value to the expected amount of Human HHV6-Ab-IgM in samples. The linearity of the kit was assayed by testing samples spiked with appropriate concentration of Human HHV6-Ab-IgM and their serial dilutions. The results were demonstrated by the percentage of calculated concentration to the expected. 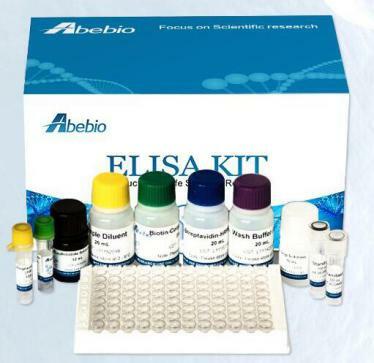 The stability of ELISA kit is determined by the loss rate of activity. The loss rate of this kit is less than 5% within the expiration date under appropriate storage condition. The loss rate was determined by accelerated thermal degradation test. Keep the kit at 37°C for 4 and 7 days, and compare O.D.values of the kit kept at 37°C with that of at recommended temperature. (referring from China Biological Products Standard, which was calculated by the Arrhenius equation. For ELISA kit, 4 days storage at 37°C can be considered as 6 months at 2 - 8°C, which means 7 days at 37°C equaling 12 months at 2 - 8°C). Serum: Use a serum separator tube (SST) and allow samples to clot for two hours at room temperature or overnight at 2 - 8°C before centrifugation for 15 minutes at 1000 × g. Remove serum and assay immediately or aliquot and store samples at ≤ -20°C. Avoid repeated freeze-thaw cycles. 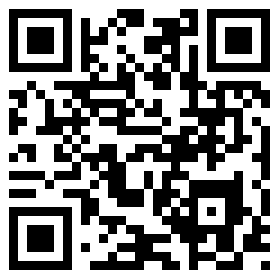 Plasma: Collect plasma using EDTA, or heparin as an anticoagulant. Centrifuge for 15 minutes at 1000 × g at 2 - 8°C within 30 minutes of collection. Assay immediately or aliquot and store samples at ≤ -20°C. Avoid repeated freeze-thaw cycles. Other biological fluids: Centrifuge samples for 20 minutes at 1000 × g. Remove particulates and assay immediately or store samples in aliquot at -20°C or -80°C. Avoid repeated freeze/thaw cycles. Store at 2-8°C. Please refer to Instruction Manual. 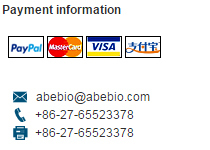 Copyright © Wuhan Abebio Science Co.,Ltd.